The full name of this hormone - HCG, and which is contained in the blood of men, but in very small amounts too - at least three mUI per milliliter. But before moving on to the positive qualities of gonadotropin, as we are going to be called for reasons of brevity, remember that and to what extent does the body's production of men's endogenous testosterone affect. Why does a man need a healthy hormone that is found only in the placenta of pregnant women? So not only to implement a prediction of the birth of the next Islamic prophet in a man? Of course not. Hormone for medical use that is limited through women in achieving pregnancy and causing the desired delivery delay in their pathological, may be indispensable in the recovery and production of testosterone in men period of steroid "cycle" output. A direct impact on this process is assisted by two hormones produced by the anterior pituitary gland - luteinizing (LH) and the follicle stimulating hormone (FSH). Both, in turn, are produced by the action of the hypothalamic hormone GnRH. And luteinizing and follicle stimulating hormones are a group of gonadotropins, that is, for the same group as our gonadotropin. Thus, it turned out that gonadotropin can be a substitute for luteinizing hormone, which provides the same as LH, the effect on the testosterone production of the male body. With the "cycle" of steroids is the almost complete suppression of the body's own production of luteinizing hormone. This immediately affects the production of endogenous testosterone - which also falls to near zero. Start the reduction of the size of the testicles - we understand something with you that there is nothing wrong with it, this reduction - a reversible process, but it is still unpleasant. Here, in order to in the middle or near the end of a "cycle" steroid "whip" the production of testosterone, to return a few atrophies the testicles anterior size and fullness, and needs gonadotropin. And yet - in the middle or near the end? At what point should you begin to apply gonadotropin? Everything, of course, depends on the length of "cycle" for long "cycles" (more than 8 weeks) the total such recommendation can be - used gonadotropins every 6-7 weeks after ("cycle") started, and, naturally, when leaving the "cycle". In the case of short "cycles" (8 weeks or less) of gonadotropin should only be applied at the exit of the "cycle". Generally enough 2-4 injections of gonadotropin for 2500-3000 ME, carried out at regular intervals of 3-4 days. Having gonadotropin and unpleasant features, one of them being HCG is the fact that this drug inhibits the production of GnRH, and as a result, luteinizing hormone. This means that "instigated since" the use of gonadotropin production of testosterone by the body will make it go back to zero, if the proper measures are not taken to improve the production of LH. If you read the article "suppressed the feminine" in the previous issue of the journal, you know, it helps restore the body's production of the anti-estrogen luteinizing hormone such drug is Clomid. Which is recommended to apply immediately after gonadotropin - this combination will help restore the production of endogenous testosterone rather quickly. Naturally, this recommendation refers to a process of "cycling" steroid in the middle has a limited meaning gonadotropin application. Among other unpleasant characteristics of gonadotropin should be taken into account its greater propensity for flavoring, which can lead to increased gynecomastia to an increase in water retention by the body and for the premature closure of the so-called "growth zones" in young athletes (well, how can you not remember the distinguished Professor Bulanov, highly recommended the use of gonadotropin are young, promoting as an alternative to anabolic steroids!) However, we will replace the steroids do not go gonadotropin And the use of this hormone for 7-10 days or does not result in side effects. Gonadotropin as a growth hormone, is marketed in a set of two vials - one containing powder in the other - the solvent. As is easy to guess, the need for solvent to mark in a syringe and injected into the vial with the powder, and then shake gently to obtain a clear solution. 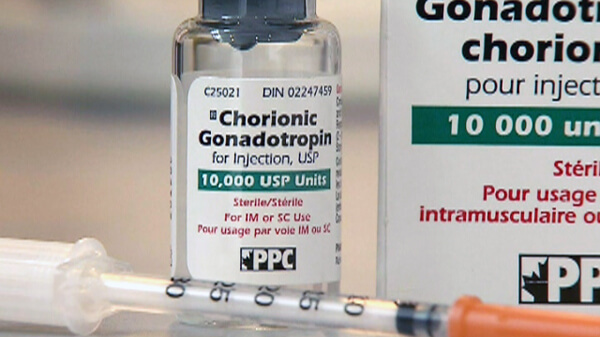 Although it is recommended that gonadotropin administered intramuscularly, it can, like insulin, and be administered subcutaneously with the same fold of fat in the stomach through, again, the insulin syringe. If you are "lucky" and got into the hands of the drug, which contains a 5, or even 10 thousand ME active ingredient, introduce it in parts and the unused solution put in the refrigerator - so it can be stored for several weeks without compromising the quality of the drug. And, finally, about the products that enter our market. The most famous of them are manufactured by Organon Pregnyl and Profasi (Serono). Approximately the same as organonovsky product is significantly cheaper. However, the newly recognized leaders began to increasingly press the Spanish production HCG Lepori Farma-lepori, they are of high quality and affordable price. I would advise you to focus your attention only on the three previous drugs and do not get distracted by other offers. That's all, maybe, what you need to know about gonadotropin preparation is definitely useful if we use it wisely.